제15차 중동여성평화회의가 중동 및 북아프리카 20개국에서 40여 명의 여성지도자들이 참석한 가운데, 5월 24일부터 27일까지 그리스, 테살로니키, 엘렉트라 펠리스 호텔에서 전쟁에서의 여성과 재건’(Women in War and Reconstruction) 이라는 주제로 개최되었다. 이번 컨퍼런스는 의장인 문난영 회장의 개회사와 테살로니키 시장과 상담 전문인의 환영사로 시작되었으며, 또한 5개의 UN 전문기구인 UNHCR(유엔난민기구), UNRC, UNRWA (국제연합 팔래스타인 난민구제사업국 국제연합기구), IMO(국제해사기구-해운업계 국제연합기구), UNICEF(유니세프)가 다양한 분쟁 속에서 평화 증진과 번영을 위해 여성이 지닌 역할과 힘에 대하여 다양한 토론과 발표가 이어졌다. 폐회식에서는 참석자들이 회의를 통해 작성되어진 보고서를 유엔과 국가 기관에 제출할 것에 결의와 합의 하며 모든 일정을 마감했다. 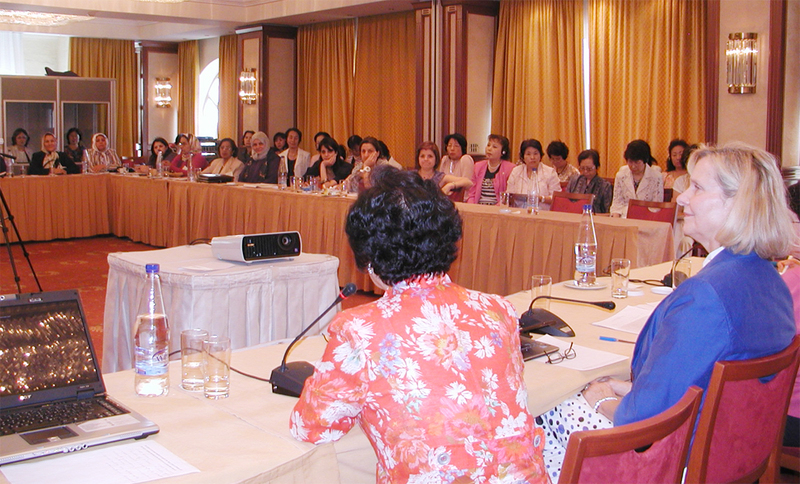 On May 24-27,WFWP International and WFWP Japan organized the 15th Women’s Conference for Peace in the Middle East in Thessaloniki, Greece. Fifty ladies from 20 countries of the Middle East, Europe and the Far East, including five UN agencies (UNHCR, UNRC, UNRWA, IMO, UNICEF) gathered to discuss the theme "Women in War and Reconstruction." One of the City Councillors, representing the Mayor of Thessaloniki, welcomed the participants. The different presentations dealt with the role and power that women have-if given the possibility-to promote peace and prosperity in a country affected by various conflicts. At the closing of the conference the participants agreed on an Appeal to be distributed to the UN and to the world's governments and various national organizations.